Soundson is an online platform for communication with sounds between people of different languages and cultures. The users are invited to participate in listening, recording and composing activities, which consist of collecting different sound materials and combining them into a collaborative composition in a process of exchange. The composition is built from progressively larger fragments assembled alternatively by each participant. Composing collectively from different locations. Distance communication, interactivity, dialogue and connectivity are the crucial components of these creative processes. The idea to create the Soundson program evolved from our personal experiences. Our friendship goes back to the years when we both lived in Paris. When Wiska moved to the US, we started to record a lot of sounds, the ones that would depict our respective environments and the ones that would convey the events of our respective lives: trips, family gatherings, everyday routine, etc. There was no internet then, so we were exchanging cassettes or minidisks by mail, like letters. This was cumbersome and slow, but we have accumulated a lot of recorded sounds that formed our personal sonic archives. When the internet became available our correspondence-by-sound grew livelier. We decided to compose together — always in a process of sound exchange — a composition comprising these materials accumulated and exchanged over the years. That is how À deux voix, moments came to being. At the time we were both involved in musical pedagogy. As educators, we saw that students of all ages and living in different countries could be introduced to musical composition through a similar process. We have called this process Soundson (“sound” in English and “son” in French). The key components of the new project became collaborative composition, group work and international exchange. From the start we foresaw the rich possibilities of developing this platform in the field of musical education. Soundson became an experimental art-in-education music program, which integrates elements of musical, environmental and technological education with multicultural exchanges. For over a decade, we have been involved in implementing our program in many educational settings. We have conducted exchanges between various countries in Europe, North and South America with groups of different ages, ranging from elementary, high school and college students to adults. Pedagogical objectives of the program derive from its interdisciplinary nature. to forge critical thinking and develop personal musical taste. to awake curiosity for sound environments from other countries. to expand knowledge about other cultures, languages and places through sound. The Soundson environment has also been a tool for our communication and a part of our creative activities as composers. In the process of exchanging sounds we have composed collectively several works. The two of them we want to discuss here are À deux voix moments and City Soundings. For many years we were corresponding with sounds sending to each other recordings of our respective environments, of events that occurred around us, as well as various poetic texts and commentaries. In this manner we have acquired an extended sound collection that depicted our respective lives. These recordings became the main building material for the piece. We have also included in the piece our instrumental improvisations for piano and accordion, as well as fragments of Schubert’s Fantasia in F minor, for piano four-hands, that we play together. Finally, we have incorporated into the composition sounds symbolizing the concept of exchange, for example the sound of a ping pong game. From all these sound materials we have chosen the ones that seemed to us the most expressive and evocative. To compose this piece, we decided to use exclusively editing and mixing techniques, without any sound processing. We attempted to create together a poetic and musical language that carries the memory of moments from our past and, at the same time, constitutes a unique and coherent musical composition. We attempted to create a real fusion between musical and narrative aspects of sound. City Soundings is a collaborative project in which a variety of cityscapes were recorded by fourteen composers from different countries and collectively assembled into a unique composition. This work reflects and combines several compositional styles brought by all participating artists. Each person recorded and uploaded three soundscapes from his or her respective city. After the bank of sounds was completed, we asked each artist to compose and upload one or several short fragments (maximum two minutes each) using all the sounds available in the bank. In the last stage, the final composition emerged after each participant modified the piece in the predetermined order. Soundson — City Soundings (2011 / 12:04). Participants to the prioject were Steven Brown (UK), Marek Choloniewski (Poland), Victoria Estok (USA), Janete El Haouli (Brasil), Brad Garton (USA), Andrew Hugill (UK), Malle Maltis (Estonia), Hernan Risso Patron (Argentina), Franziska Schoeder (Ireland), Susanne Skog (Sweden), Andreï Smirnof (Russia), Marie Wennersten (Sweden), Lidia Zielinska (Poland), and Project Coordinators Andrea Cohen and Wiska Radkiewicz. In the area of education we would like to expand the Soundson program into a socio-cultural domain. We think it can become a valuable way of connecting youth from different countries through community or cultural centres. We have also envisioned projects in which similar sound exchanges could be happening at the level of entire cities. We also want to expand the idea of collaborative soundscape composition, by bringing the project into specific places (festivals or conferences) and by working on more site-specific adaptations of the activities. We will develop our presence online as well, by initiating collaborative projects, each proposing a different way of composing, but each resulting in a collective composition created from soundscapes recorded by participating composers. Andrea Cohen is a pianist, sound artist and radio producer. Born in Argentina, she has been living in Paris since 1974. She is an author and performer of several musical theatre works in which musical and theatrical elements are integrated into a personal, pluridisciplinary language. She has also composed incidental music for theatre, video and radio, and has composed an opera, Fois il était une deux trois, played by children. 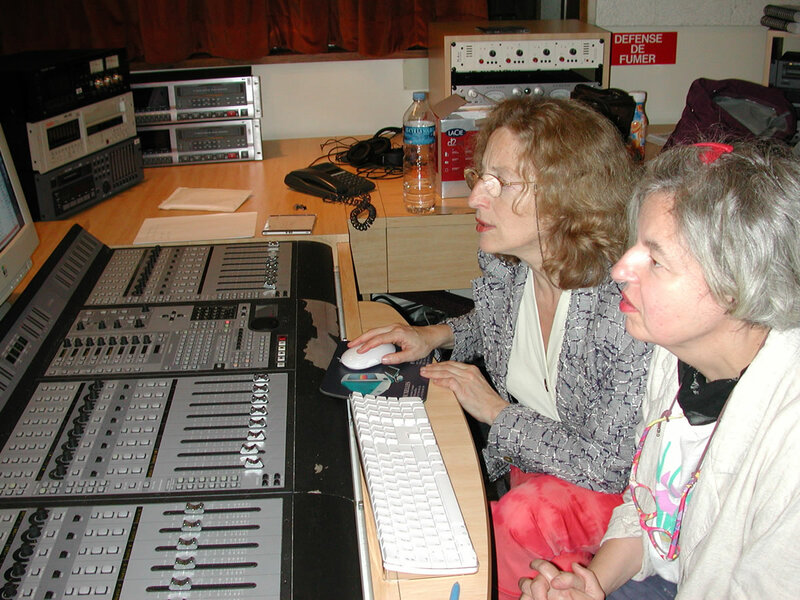 As author of numerous radio programs and works, she has been collaborating with Radio France (France Culture) since 1985. In 2005, she was awarded a doctorate by the University Paris-Sorbonne, where she successfully defended her theses “Composers and Radio Art.” From 2007 to 2011 she was an Associate Researcher of the IOCT (Institute of Creative Technologies) at De Monfort University (Leicester, UK), where she developed the Soundson Program with Wiska Radkiewicz. Wiska Radkiewicz is an electronic music composer, sound and video artist. She received training at the Music Academy of Warsaw, Poland (music theory), University of Paris-Sorbonne (musicology), Groupe de Recherches Musicales — Conservatory of Paris (electronic music composition), City University of New York (computer music composition) and Princeton University, where she obtained a doctorate degree in music composition. Her interests range from musical improvisation, electronic composition and music pedagogy to radio and video. From 2007 to 2011 she was an Associate Researcher of the IOCT (Institute of Creative Technologies) at De Monfort University, Leicester, UK, where she developed the Soundson Program with Andrea Cohen.